The city bus line 8 runs from Viktorija stop (Ploce) to Ploce Gate, Pile Gate, Boninovo, Vukovarska street, Gruz port, main bus station, Andrije Hebranga street, Ilijina Glavica, Cable car lower station and returns to Viktorija bus stop. Take this bus if you need to reach ferry & cruise port or main bus station from Ploce or Old Town. If you are a cruise passenger to Dubrovnik take bus no. 8 from Gruz harbour to the Cable car embarkation station. Bus route 8 runs from early morning until evening, every half and hour. Check out below bus stops on this route. Check out the latest timetable of bus no. 8 here. This bus stop is situated east of the City walls. Grand Villa Argentina and Hotel Excelsior are situated close to this bus stop. Ploce Gate is situated only a few steps from this bus stop. This is the eastern entrance to the Old Town from where you can easily reach Stradun street. The entrance to the City walls (in St Dominic's street) is a few minutes walk from this stop as well as the old city port (boat for Lokrum island departs from here). In this area you will find a great choice of private accommodation facilities. This bus stop is close to the third entrance to the Old Town - Buza Gate. Embarkation point of Dubrovnik cable car is located only few minutes walk from this bus stop. This bus stop is departure point of most city buses. Here you can embark the bus to the port, main bus station, beaches in Lapad and Babin Kuk. The airport shuttle bus stops here on its way from Dubrovnik airport. At this point you can find taxi rank with 24/7 service. One of the most exclusive hotels in Dubrovnik, Hotel Hilton Imperial, is situated only a few steps from here. This bus stop is close the University of Dubrovnik. This bus stop is situated close to the cemetery of Dubrovnik. A short walk from this bus stop you will find Hotel Bellevue. This area is knows as Dubrovnik downtown. You will find here banks, exchange offices, supermarkets, department stores, newspaper shops, pharmacies, bakeries, restaurants, cafés etc. This bus stop is situated in the port area. Nearby you will find a great choice of local restaurants and cafés. Get off at this bus stop if you need to embark ferries to the nearby islands as well as international ferry to Italy. Dubrovnik tourist office is located in the port building. From the nearby pier you can catch organized tours to the islands. Green market from where you can buy local produce as well as fresh fish and sea food is located only few steps from the bus stop.Hotels located nearby are Hotel Petka and Hotel Berkeley. 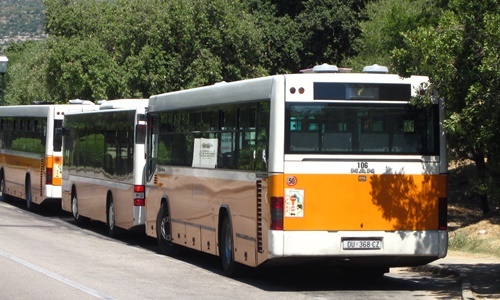 This bus stop is located right on main bus station - departure point of all intercity and international buses from Dubrovnik. Cruise ship terminal where most cruises visiting Dubrovnik dock is located nearby. Take bus no. 8 to reach Cable car embarkation station in the neighbourhood of Ploce, above the Old Town. This bus stop is situated only few steps from 3-star Hotel Berkeley and a short walk from ferry terminal and main bus station. In this area you will find a great choice of private hostels and apartments. This is peaceful area only a short walk distance from ferries and boats sailing to the islands (Elaphite islands, Mljet, Korcula, Brac, Hvar) and the port of Split in Central Dalmatia. In the near vicinity of the bus stop you will find kiosk, cake shop, pet shop etc. This bus stop is located in the area of Dubrovnik called Sipcine. From here you can easily reach Dubrovnik downtown and port area. Here you will find supermarkets, bakeries, pizzeria etc. From this quiet residential area you can reach Dubrovnik sights in only 15 minutes walk. You will find here grocery shops and cafés. The Old Town can be reach in only 10 minute walk. This bus stop is very close to Dubrovnik Public garage which is convenient for parking a car if visiting Old town. A wide choice of apartments and guesthouses can be found in this area. If you take any street leading down from here you will reach Old Town. This bus stop is situated just next to Minceta Fortress. Get off here and take stairs leading down to reach Pile Gate - western entrance to the Old Town. This bus stop is just in front of the Cable car embarkation station. Stairs from both sides of the bus stop lead you to the Old Town. In this area you will find numerous apartments and other private accommodation. This area is great choice for those wanting to stay close to the Old Town. Get off here to reach one of the most attractive beaches in Dubrovnik - St James beach. Only a few steps from the bus stop there are stairs which you need to take to reach this beach. At the bottom of the stairs turn left and continue walking for about 15 minutes to reach St James beach.